On Tuesday, senior executives from the big three tech giants, Google, Facebook and Twitter, appeared before a Senate Judiciary subcommittee chaired by Republican Lindsay Graham. The purpose of the hearing was to give further testimony on the subject of “Russian meddling” through the use of social media services. According to Edgett, two of those accounts were @RT_COM and @RT_America. “Together, the two accounts spent $516,900 in advertising in 2016, with $234,600 of that amount devoted to ads that were served to users in the US,” he said. RT, for its part, has not been made aware of any policy changes by Twitter, and which, if any, of the network’s promoted content has allegedly violated these new policies. 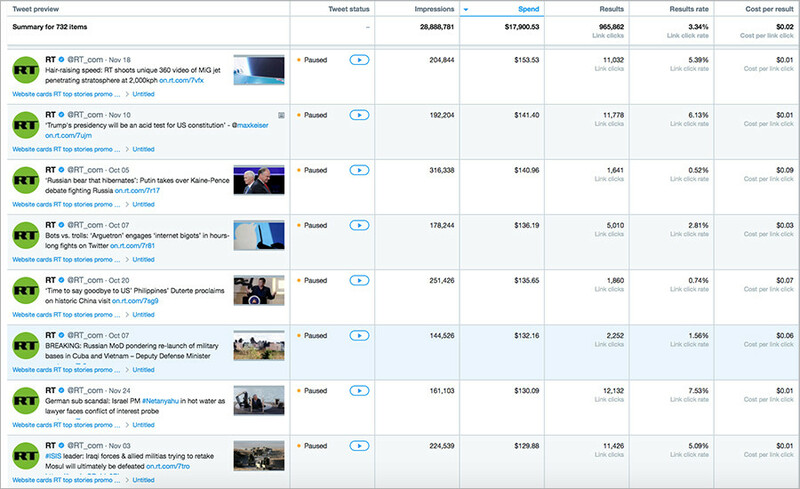 In a response to the statement by Twitter’s Acting General Counsel, RT is revealing the details of its advertising budget spent in 2016, as well as tweets promoted by the network on @RT_America and @RT_COM – including the top ones – in September, October and November. 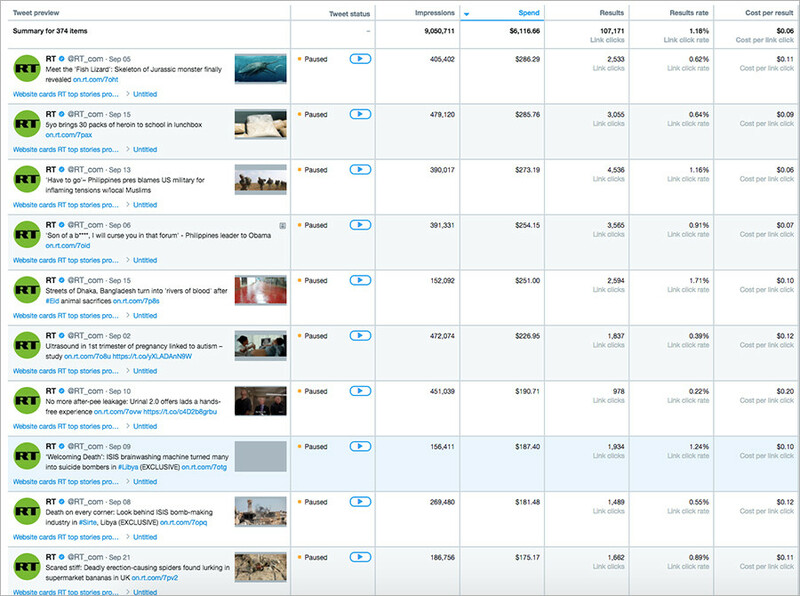 According to RT internal documents, both accounts spent on a year-long international ad campaign some $515,000 with @RT_COM channeling $475,000 and @RT_America some $40,000 respectively, to promote both individual stories but also to advertise the accounts and RT news apps in general. Which tweets did RT promote? 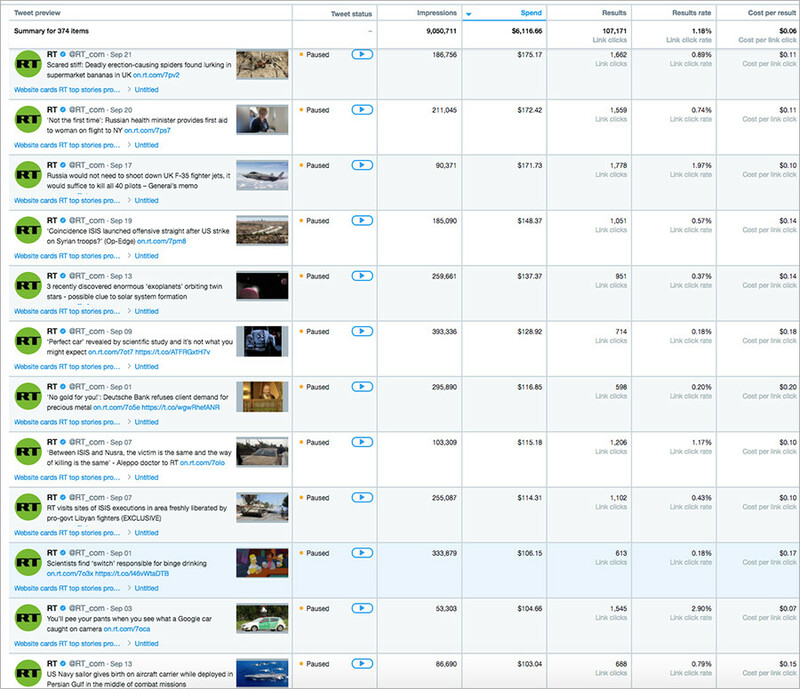 Well, you can see for yourself: Below are the top 20 @RT_COM tweets from September. As can be clearly seen from the screengrab, the top promoted tweet linked to a story about a fish lizard skeleton of a creature that inhabited the planet during the Jurassic period. How much money was spent? A staggering $286. 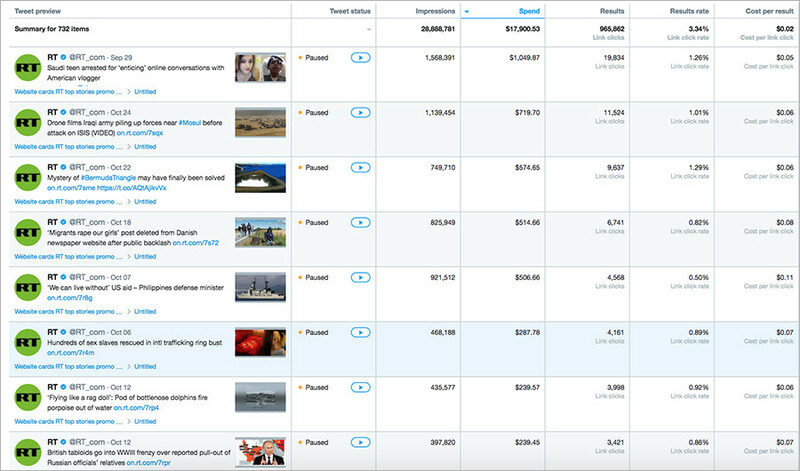 Here's a list of the top 50 promoted tweets that were promoted from September 29 through the end of November. 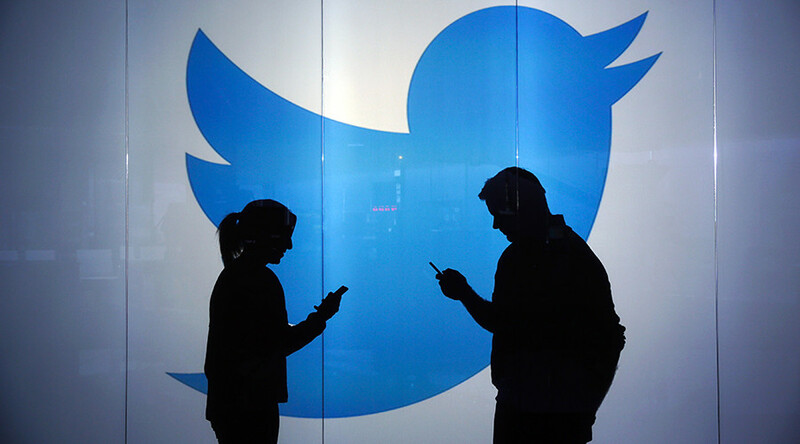 A tweet about the arrest of a Saudi teen for talking with an American vlogger tops the chart. The amount spent? Slightly over $1,000. This was September 29th top promoted tweet at @RT_COM, which reaches followers worldwide. But what about October? Here you go: the dashboard says it loud and clear that this was a tweet about the Iraqi army getting ready for the Mosul offensive. RT spent $719 on it. 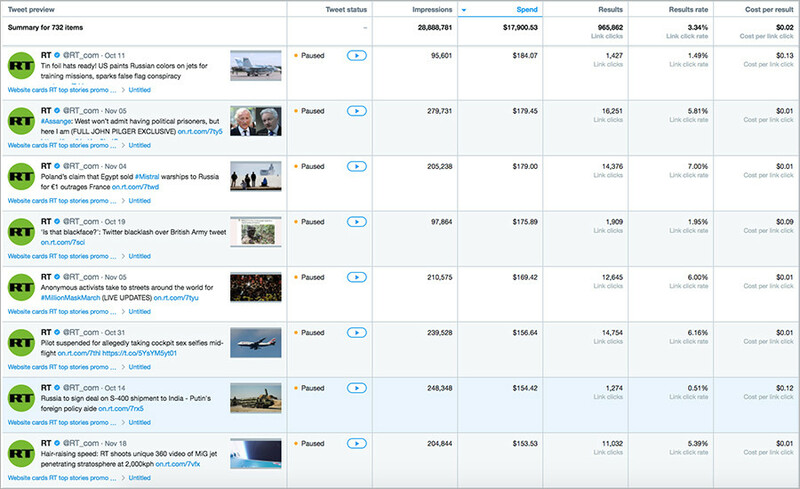 Now, if you take a look at November, you will see that the top tweet was of Russia deploying anti-ship missiles to its Far Eastern Kuril Islands, with some $217 spent on its promotion. 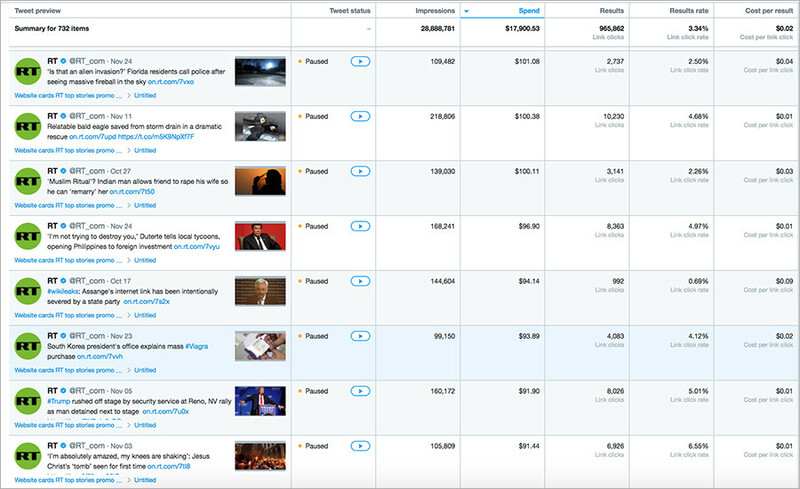 Out of 70 top promoted tweets only five had links to the US presidential campaign. The story about Donald Trump addressing Hillary Clinton’s email scandal in a presidential debate set RT back some $185. Another one – on the prospects for oil prices in case Trump decides to scrap the Iranian nuclear deal – has cost just over $204. 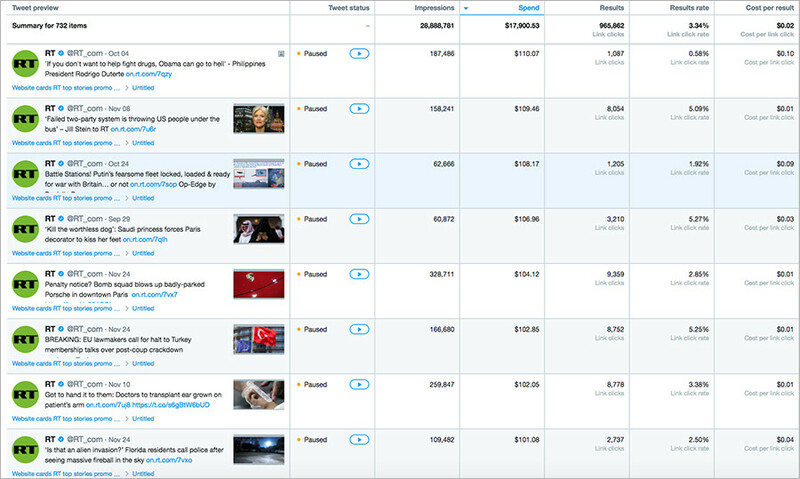 Some $141 was spent to promote a tweet on Max Keiser's describing Trump's presidency as an acid test for the US constitution. 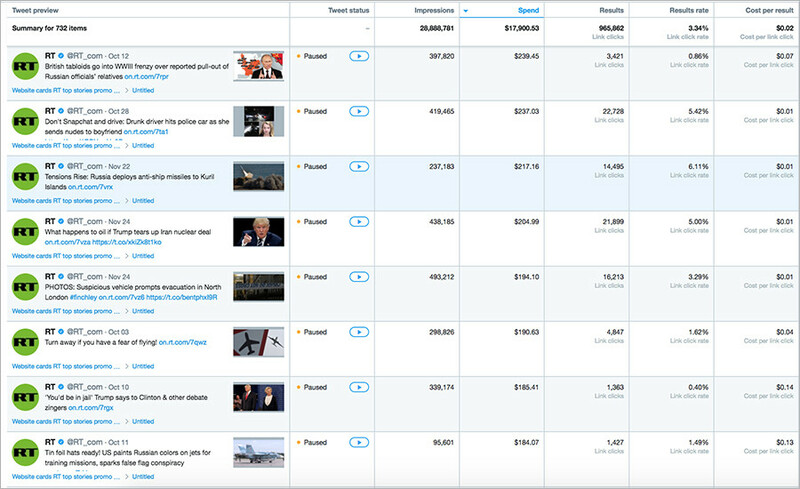 Also, RT spent some $109 and $92 on tweets about Jill Stein talking about America's two-party system and Trump being rushed off stage in Reno respectively. Just 5 tweets out of 70. RT America also ran a Twitter ad campaign throughout 2016. 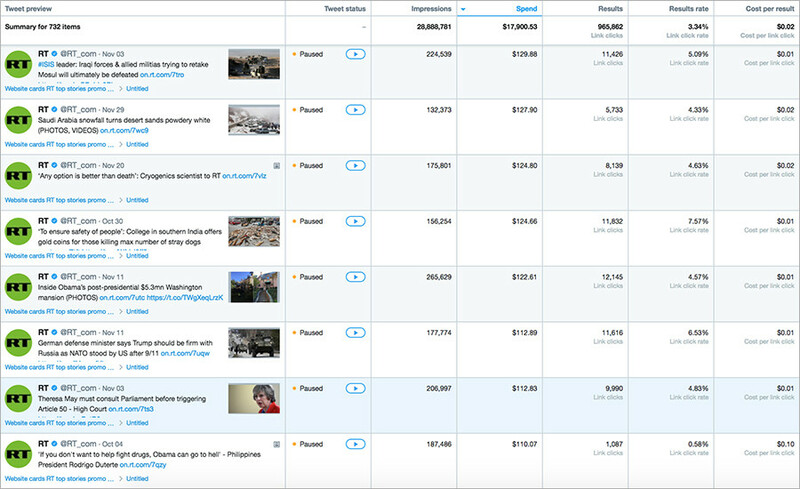 During this time, the account promoted 135 stories at the aforementioned total cost of just over $40,000. RT America reporter Nebojsa Malic was doing a Facebook Live broadcast at the time when hundreds of Bernie Sanders supporters walked out of the Wells Fargo Center as Hillary Clinton became the Democratic nominee to run for the White House. Price paid? $12,000. Indeed, as RT has earlier revealed, Twitter tried to convince RT to spend $3.3 million on ads promoting just RT’s US election coverage over the course of just four months. Sadly, therefore, it looks like Twitter executives yet again failed to get their facts straight while appearing before the esteemed senators.